Our 2 bedroom, split level townhome goes beyond the hotel experience to give you a sense of home while you are in Lexington. 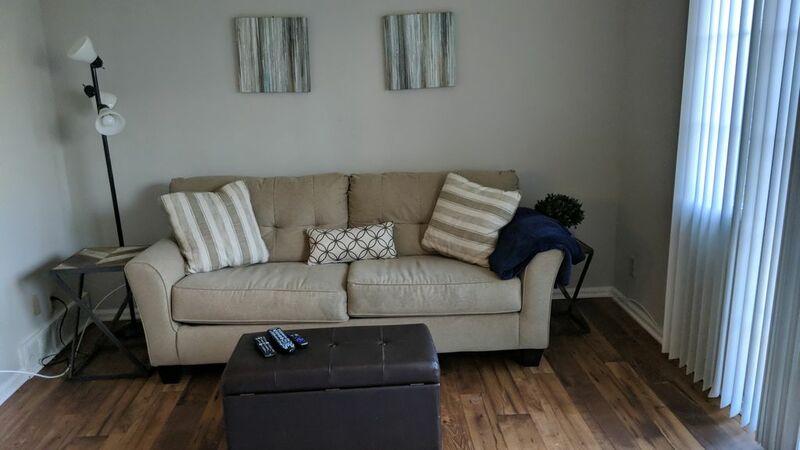 Our main level features wood style flooring, a spacious, open floor plan, half bath, newly renovated kitchen with new appliances, and spacious living area with access to the patio. Both bedrooms are upstairs, featuring hardwood flooring. The upstairs bath is spacious with a tub/shower combo. Both bedrooms also have large closets with ample storage. Whether you are here for work, school, or leisure, we know you will be able to unwind from your busy day, relax, and prepare yourself for all that Lexington has to offer tomorrow! Lexington, Kentucky, is known for horse farms, bourbon, and the University of Kentucky. Richmond Commons is ideally located to give you access to all of this and more! With a convergence of a variety of cultures and influences, you'll appreciate Lexington's rich history through it's restaurants, boutiques, art exhibits, and entertainment. You'll find a wide range of top rated dining experiences to compliment bourbon, craft beer, or wine tastings; all a short Uber or Lyft ride away. The University of Kentucky is only 2 miles from our property, making this an ideal location for UK games, graduation, or any special Wildcat event. For a bit of an off the beaten path UK experience, consider a stroll through the Arboretum grounds, accessible from campus. There are so many reasons to spend time in Lexington; Richmond Commons gives you easy access to all of them!